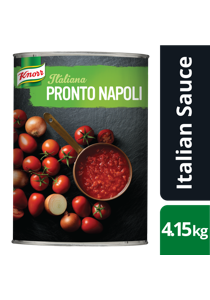 Each can is made from more than 6kg of Italian tomatoes. Grown and produced sustainably in the Emilia Romagna region. Ripe, Pulpy tomato taste with just a hint of spices. Just like fresh tomatoes - totally GLUTEN FREE. Made with Italian tomatoes and packed with flavour. Harvested from Italian fields to cans in under 24 hours. Ready to use Napoli (tomato) base sauce. Weight: 4.15 kg. Weight per serving/portion: 100 g.
No additional ingredients required, saves time and provides excellent cost control. Consistent quality and taste. Versatile product: can be served on its own or easily enhanced by adding your personal touch.